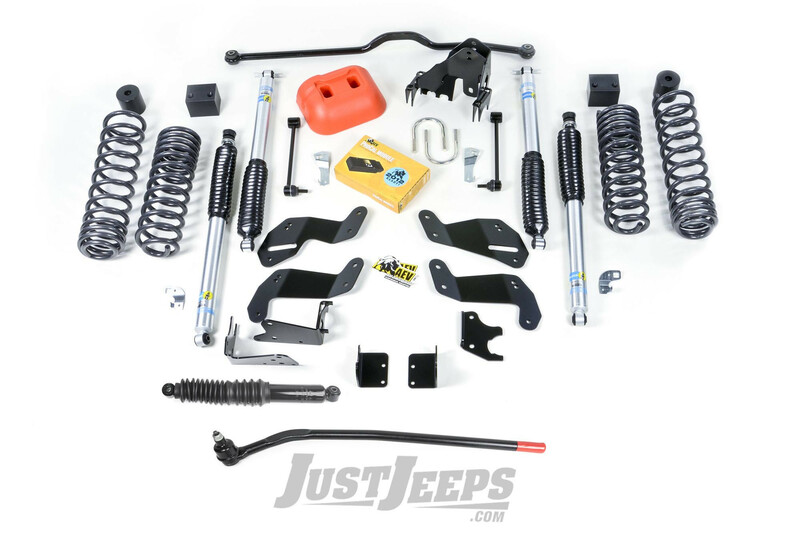 Just Jeeps AEV 3.5" DualSport SC Suspension System With Bilstein Shocks For 2007-18 Jeep Wrangler JK Unlimited 4 Door Models - Lift Kits - Suspension 3.5-4.5 Inch - Shop By Part | Jeep Parts Store in Toronto, Canada. EV's DualSport Suspension Systems have taken off-road suspension engineering to the next level. At AEV, suspension development is about more than just adding lift height, articulation, or flashy-looking components. It's all about bringing OE-level suspension engineering to the aftermarket to create a true do-anything "dualsport" suspension - one that is both extremely capable off-road, while offering unparalleled on-road performance and handling. To achieve this, AEV relied on factory engineering methodology. The first step was to start with the JK's control-arms, track-arms and steering. The geometry of each component was optimized to accommodate the new lifted posture of the JK. It may surprise people to learn that proper geometry is where AEV's DualSport Suspensions get much of their tremendous cornering and braking characteristics. The truth is, when the geometry is right, the springs and shocks don't have to compensate for poor performance in these areas. After the coil springs were dialed in, AEV then partnered up with the engineers at Bilstein to develop a proprietary shock tune to match this unique suspension. Together, engineers from both AEV and Bilstein spent days at a proving grounds facility testing numerous valving combinations in an array of simulated driving conditions. Thanks to the previous optimization of AEV's geometry and coil springs, the shocks were able to be tuned with a focus on damping suspension movement - rather than on trying to mask unwanted handling problems resulting from poor geometry or spring tuning.